The Last Thing You Should Do. The Last Thing You Should Do (with Robert Smith, 50th Birthday concert). The Last Thing You Should Do (live, 1997). Bowie had a sharp sense for personal narrative and maybe he thought that the time to rehabilitate Tin Machine hadn’t quite arrived. But he later said that “Last Thing You Should Do” had become one of his favorite tracks by the time of album sequencing, and that it better fit the mood. And true, the track was Earthling in miniature: drum ‘n’ bass-inspired percussion loops, melancholic verses with a word-game lyric, savage guitar breaks, the occasionally-deployed shriek and groan, Mike Garson trying to worm his way in. Its various pieces didn’t quite hold together; they seemed in a tense non-aggression pact. So listening to the track felt like crossing borders, which sharpened the flavor of each section. The Reeves Gabrels guitar break is Gabrels throwing taste and restraint further out the window than usual, with his slashing progress through three power chords encouraged by spliced-in Bowie “yeahs!” and slightly mocked by Garson slowly creeping his way down to the bass end of his keyboard. The “jungle” break is Mark Plati and Zach Alford frenetically trying to create the drum loops/ live beats master duel that the record had promised and had never quite delivered. And the three verses, built on a foxing progression that hangs between F minor, F# minor and A-flat major, are the weariest on the album, with a two-chord synthesizer drone hanging overhead like a storm cloud. Bowie started with a question: What have you been doing to yourself? and answered it with the title line. “I think it’s very much of its time as a song: one has to be very selfish and protective about oneself if you’re going to survive these days,” he told Andy Gill in 1997. Singing into an empty water bottle for effect, Bowie glumly repeated a line three times, then closed it off with the title phrase, whose last syllables he bloated and contorted. It’s the sound of an unwanted daybreak, clubtime over; it’s sung by a man who should’ve been in bed hours ago, waiting for a bus or a cab, wondering what he’s doing with his life (it’s also the closest Bowie ever came to doing a Neil Tennant impression). Though “Last Thing” was sequenced midway through Earthling, its title was true: it’s the album’s spent-out coda. Recorded August 1996, Looking Glass Studios, NYC. Performed on the Earthling tour, 1997. * Reportedly “Disco King” was tried out as a samba, a tango and a march during these sessions. 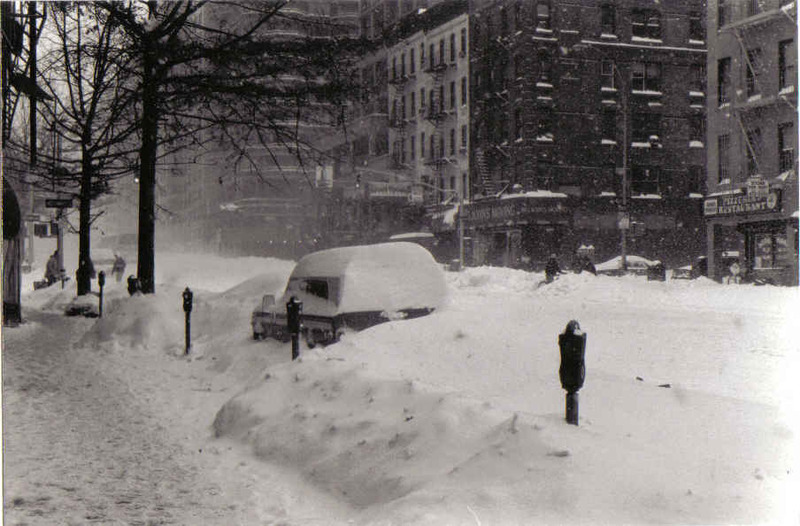 Top: CO, Blizzard of 1996, from the vantage pt of 83rd St and First Ave., NYC (my old neighborhood).